Cupcake, my love: Who Says Granola is Boring? Who Says Granola is Boring? 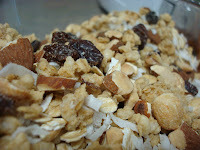 Back in the day granola was thought as something boring and bland. Just a bunch of oats toasted up and nothing special or fancy. Lately though granola has been all the craze. With it's versatility and variety of flavor combonations what's not to love? Especially when you can add granola to a cookie! Yes that's right...a COOKIE. (And dare we call it healthy? Sure why not ;) ) With this week's Tuesdays with Dorie we did just that! We turned already scrumptious (yet a little boring) granola into one of the best, and I mean best, cookies I have ever had. 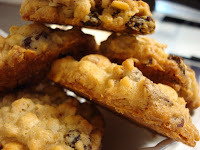 The combination of almonds and peanuts into the batter gave it such a crunchy texture, and the nuts were practically roasted while the cookies were baking, which really brought out that nutty flavor. And I am such a sucker for raisins, especially in cookies. There's something about a hot oven that can plump up raisins, that really gets me going. I really love how these cookies are sweet but not too sweet either. When I usually eat cookies I can only have one, maybe two, at a time because they give me a tummy ache. But not with these bad boys! Which, now that I think about it can turn out to be a big problem if you know what I mean! 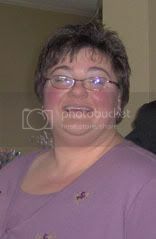 Excellent, excellent choice Michelle! 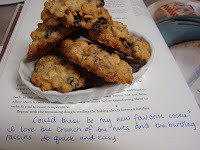 Check out the recipe at Michelle's Bad Girl Baking blog!! Yeah, these are definitely dangerous. 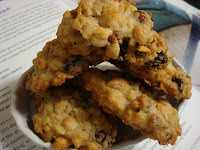 I doubled the raisins in these too - gotta love raisins in cookies! Mine were TOO sweet! I wish mine were more like yours! They look great! I think these cookies are going to become a quick favorite in my house! Yours look delicious! I call them healthy, as long as I don't think about the near 2 sticks of butter. :) But so good, right?! These were totally excellent cookies. Its definitely a cookie plus when you don't get a tummy ache. Glad you liked them! Looks great!!! These look really delicious. Great job! I love granola too! Awesome pics! I could not eat just one of these. i like that note you jotted down in the book! these do look like great cookies! Whoo-Hoo! Bring on the cookies! 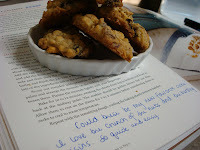 I love the idea of making notes in Dorie's book! Somehow books always seem sacred to me, but I'm sure I'd appreciate reading my opinions later. Your cookies look great.